Silk is a protein fiber made from silkworms and is the only natural fiber that is a filament fiber. Silk fibers spun by several species of arthropods have existed naturally for hundreds of millions of years. glands in the mites, spiders, and several groups of insects. caterpillars (larvae of moths and butterflies) before pupation. 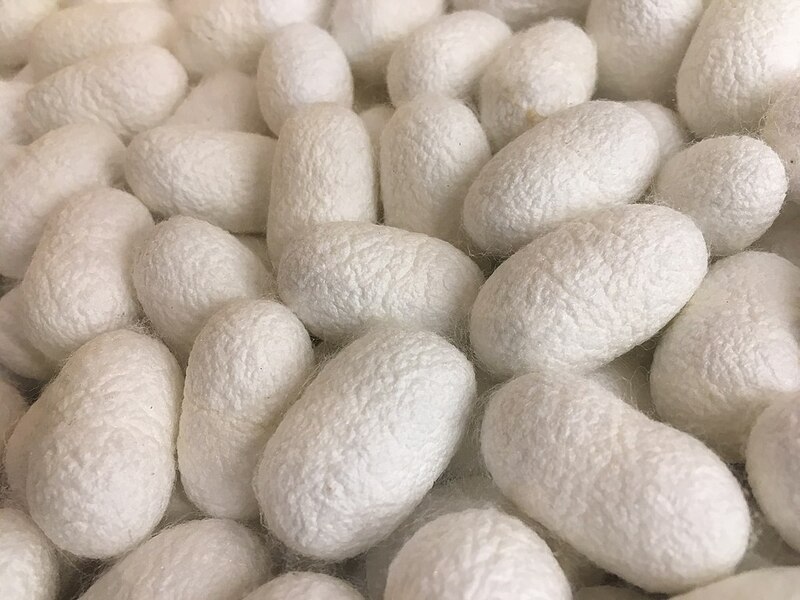 Until the discovery of nylon and other synthetic fiber polymers, the silk of domestic silkworm, Bombyx mori, was an economically and, at the time of war, also strategically important commodity. Silk is an animal fiber, produced by caterpillars belonging to the genus Bombyx. A single silk filament is the product of a series of stages derived from the cultivation of mulberry trees for feed to the propagation of the domesticated silkworm, Bombyx mori. During the caterpillar phase, the worm wraps itself in a liquid protein secreted by two large glands in its head. This secreted protein hardens upon exposure to the air. The resulting filament is bonded by second secretion, sericin, which forms a solid sheath or cocoon. Under natural conditions, a moth eventually breaks through the cocoon. In sericulture, the larva is killed in the cocoon by steam or hot air in the chrysalis stage before its metamorphosis. Sustained heat processing softens the hardened sericin so that the filament can be unwound. The silk filament is a continuous thread of great strength measuring from 500-1500 meters in length. Single filaments are too thin for utilization. For production purposes, several filaments are combined with a slight twist into one strand. This process is known as “silk reeling or filature”. Silk is a premium priced agricultural commodity, although its sheer volume is less than one percent of the market for natural textile fibers. The international demand for high-quality silk has multiplied. Appropriate cocoon-drying techniques and reeling operations are vital to supplying good quality silk. The silk glands of the Bombyx mori are structured like tubes consisting of a Posterior, Middle and Anterior section. The Posterior is long and thin. The Middle is short with a diameter measuring 3-4 mm. The Anterior is extremely thin, leading to the spinneret in the head of the larvae from which the silk is excreted. yellow, yellowish green and golden yellow. Shape Cocoon shape, as color, is peculiar to the given species. Generally, the Japanese species is peanut-shaped, the Chinese elliptical, European a longer elliptical and the polyvoltine species spindle-like in appearance. Hybrid cocoons assume a shape midway between the parents. Wrinkle The deflossed cocoon has many wrinkles on its surface. Wrinkles are coarser on the outer layer than within the interior layer. It is recognized that coarse wrinkled cocoons reel poorly. Cocoon Weight The most significant commercial feature of cocoons is weight. Cocoons are sold in the marketplace based on weight as this index signals the approximate quantity of raw silk that can be reeled. Pure breeds range from 2.2 to 1.5 g, while hybrid breeds weight from 1.8 to 2.5 g.
silk shell is the most consequential factor as this measure forecasts raw silk yield. preferred for good quality cocoons. reeled from a given quantity of fresh cocoons under the transaction. In newly evolved hybrids, recorded percentages are 19 to 25 percent, where male cocoons are higher than female cocoons. Raw Silk Percentage The normal range is 65 to 84 percent for the weight of the cocoon shell and 12 to 20 percent for the weight of the whole fresh cocoon. reliable while the remainder is removed as waste. Reliability Reliability is defined as the fitness of cocoons for economically feasible reeling. Reliability is greatly affected by careful action during cocoon spinning, drying, storage, pre-processing, reeling machine efficiency and operator skill. The measured range is from 40 to 80 percent with serious deviations depending on the type of cocoon. cocoon filament is 15 to 20 microns for the univoltine and bivoltine species. Lousiness Hair-like projections in the silk fiber are called Lousiness. Another factor promoting lousiness is mounting of over-mature larvae. When fabrics woven with these defects are dyed, it looks as if the fabric is covered with dust or is a paler shade than the rest. In fact, the protruding fibril is more transparent and has a lesser capacity to absorb dyes. indirect method of reeling on small reels, and the transfer of reeled silk from small reels onto standardly sized reels on a re-reeling machine. The last technique is primarily applied in modern silk reeling processes. This primitive spinning apparatus is operated by two hands – one to drive the wheel and the other to feed in cocoons. One end of the reeling thread is wound onto each wheel, while cocoons are boiled in a separate pot. In raw silk production, the continuing increase in labor costs has mandated automation. Around 1950, the Automatic reeling machine, which controls the number of reeling cocoons per thread, was invented. Shortly thereafter, it was replaced by a second Automatic reeling machine, which could automatically control the size of the reeling thread. The Automatic reeling machine mechanizes the processes of groping ends, picking ends; cocoon feeding to reeling thread and separation of dropped end cocoons during the reeling process. The efficiency of the Automatic reeling machine compares favorably with the manual Mult-ends reeling machine. The Automatic reeling machine though built to replace manual reeling still requires manpower for problems with the reeling thread, which must be corrected by hand. A moderate amount of cooked cocoons are carried to the newly cooked cocoon feeder and then removed into the groping end part. The end groped cocoons go to the picking end part and the correctly picked end cocoons are dispensed to the cocoon supplying basket which continuously rotates around the reeling basin on an endless chain belt. Usually, the reeling method is classified into the fixed cocoon feeding system and moving cocoon-feeding system. The composition of the whole cocoon is defined as the cocoon shell, pupa and cast off skin. The pupa makes up the largest portion of its weight. Note that much of the cocoon content is water. Therefore it is necessary to remove the water to improve the cocoon filament for reeling and to better preserve the cocoon over a long period. fats, wax, sand pigments plus minerals. alanine, 42.8 g, and 32.4 g respectively. Gravity: The bave specific gravity on average of sericin and fibroin measures from 1.32 to 1.40. Generally, the specific gravity of sericin is slightly higher than that of fibroin. the tenacity of a bave is 3.6 to 4.8 g per denier. breaking. Raw silk has an elongation of 18 to 23 percent of its original length. for silk; the mercantile weight of silk is derived based on this factor. to light than degummed silk. Electrical Properties Silk is a poor conductor of electricity and accumulates a static charge from friction. This trait can render it difficult to handle in the manufacturing process. This static charge can be dissipated by high humidity or by maintaining an R.H. of 65 percent at 25ºC. The action of Water Silk is a highly absorbent fiber, which readily becomes impregnated with water. Water, however, does not permanently affect silk fiber. Silk strength decreases about 20 percent when wet and regains its original strength after drying. The fiber expands but does not dissolve when steeped in warm water. Note that the fiber will also absorb dissolved substances present in water. Effect of Heat If white silk is heated in an oven at 110ºC for 15 minutes, it begins to turn yellow. At 170ºC, silk disintegrates and at its burning points releases an empyreumatic odor. Degradation by Acids, Alkalis Treatment of silk fibers with acid or alkaline substances causes hydrolysis of the peptide linkages. The degree of hydrolysis is based on the pH factor, which is at minimum between 4 and 8. Proteolytic Enzymes Proteolytic enzymes do not readily attack fibroin in a fibrous form apparently because the protein chains in silk are densely packed without bulky side chains. Serious degradation may be caused by water or steam at 100ºC. Other Agents Chlorine attacks fibroin more vigorously than does sodium hypochlorite. The oxidation is mainly at the tyrosine residues. traditional farmed in tropical zones. Silkworms Eat Mulberry Leaves 1 from PandaSilk on Vimeo.